Before, long before the entertainments that exist today, children played in ways that now, unfortunately, are almost unthinkable. They played with literature, played history , played princes, witches, toads, fairies or Swordsman. They played "to be". Some cut and decorated characters, beat on cardboard and invented the great adventure of the afternoon. 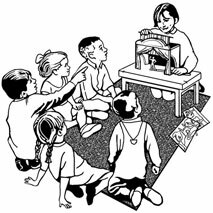 Others collected editions for youth toy theaters; folk tales and historical to represent life and literature. It was enough a table, drama and imagination. They played with Theaters Paper, Papiertheater in Germany, Dukketeater in Denmark, Toy Theatre in England and here, Theatre of paper. Other times… good times to imagine… Come and see two centuries of imaginative and intelligent game. If there is something I can say on the subject of “collecting,” it is that there should definitely not be the possibility of conjugating the verb: I would collect, I collected, I will collect? Impossible. There is no room for the simple past, the past perfect, the participle or the conditional—only the present and, to be fair to our rich language, the gerund, because there is no end to it. The act of collecting is, in itself, an impulse. I collect Toy Theatres. Today I have to write about my collection, and it turns out to be a rather difficult task. I suppose these two things cannot be compared, but I have the same feeling I get when I read a catalogue about painting: the words seem superfluous; it is enough to took at what the painter did on canvas, to admire it or go straight past it. I see my theatres as art that is inspired by art, as real buildings which were reduced, drawn, and published for the enjoyment of the first owner and the last one (i.e., me, at the moment). The fact that I am writing this means that my little treasures are, once again, coming out of the drawers where they are usually kept. The story of my collection starts a few years ago, when my sister Victoria decided I should keep one of our family treasures, after she had patiently and lovingly restored it. The item in question was a toy with which we had the good fortune of living out the stories we invented and wrote. We always knew it was a very special possession: the “Teatrito Seix Barral”, which had belonged to our father, Damián, and his sister Marujeta (a very unique woman, by the way). That toy had accompanied through their childhood, which had been quite different from ours, because of the Civil War. I suppose that, although it played a part in my girlhood memories, the fact that I then had it at home and could admire it on a daily basis spurred an interest that grew and which eventually became a passion. And, almost without noticing, one day, while I was rearranging some cabinets, I realised I had an enormous amount of little theatres. Only now, as I am describing this process, have I come to the realisation that I am trying to justify this madness. Let it be known, then, that it was never conscious or intentional. In 2007 I met Paco and Pilar, who are the heart and soul of the puppet company Titiriteros de Binefar. They were the first ones who wanted to share the magic of these toys and organise an exhibition. And they decided to do it in a very special place in the Pyrenees, Abizanda, a place where I found the same feelings that had led me to become a collector, the passion and dedication to objects, houses, places and jobs that are truly unique in these “modern” times we live in. I would like to take this opportunity to express my absolute gratitude to them. I wish that, between us all, we could recuperate, for the sake of children (and this is something that is the exclusive responsibility of adults) the now almost looked-down-upon habit of finding pleasure in reading and playing with texts, with words, beyond the trends and impositions made by the industry, and to give them the opportunity to be the active protagonists of games, rather than mere manipulators of alienating gadgets that are devised with the sole intention of making huge profits yet greater or propagating trends and ideas designed by the powers that be, that is, by big economic interests. Sleeping a deep sleep after pricking one’s finger with a spindle, travelling on magic carpets, kissing a frog and turning it into a handsome prince, having a wolf swallowing up your grandmother with one bite, kings and paupers, historical battles and social injustices, journeys to the centre of the Earth and impossible machines—literature feeds on what has been lived and what has been dreamt. The Paper Theatre acquires all its significance from the universe born out of the pages of a book, which, as I see it, makes it a Toy, with a capital T.
For a time, paper theatres were the protagonists of that utopia: they were a book to play with; therefore, a perfect mixture between playtime and schoolwork, between what is imagined and what is imposed. The stage was a reflection of the real world that was out there to be explored; the sets were the landscape through which one could move; the stories and librettos were the real-life conflicts that were proposed and the words that had to be learnt; the lights and added music were the only possible “special effects” and, finally, the characters, the little pieces of cardboard through which a child could turn into a prince, a bandit, a witch, a creature or a forest, were vehicles to unfold a different possible consciousness of their existence in the real world. I like to imagine that perhaps some of my theatres belonged to families from Victorian England, or that some of the characters I have were coloured or decapitated by a girl in a velvet dress with an enormous bow in her hair. In our country, I imagine the children living in the reality of the pre-war, the war and the post-war. I imagine their day-to-day existence as the opposite of the protection provided by a fantasy shelter in the shape of a paper theatre. Among others, I imagine my father. Such is the magic of objects which have had previous owners; that is the real value of my theatres, the story each one of them brings along and accumulates. I want to thank the Muvim and, very specially, Carlos Pérez, its curator. One day I came to the museum with my photographs, and his enthusiasm regarding the possibility of showing my theatres was almost immediate. It comforts me to know that at least some of our institutions have people working in them who have the necessary sensibility to appreciate and find a niche for the crazy people who spend their time and money unearthing what is hidden. Valencia (SPAIN) 2008, Lucia Contreras Flores.